Pork For Protein | Take A Break From Chicken! Pork For Protein – Take A Break From Chicken! 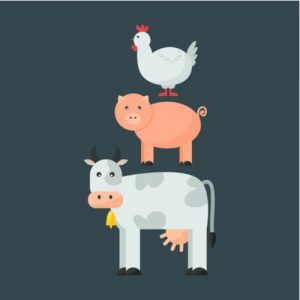 Is there a reason, bodybuilders, athletes and others involved in sport, are avoiding our 4 legged piggy pals when searching out the healthiest protein sources… Why? Well, there are a couple of reasons that could explain porks bad reputation: sausages, bacon and other processed pork types like pepperoni are all high in fats and salt, this could put off some when choosing pork for a healthy option, another is the misconceived idea that pork is low in protein. This article will hopefully prove to you that choosing pork for protein can be a healthy choice when you are next in the supermarket contemplating the week’s protein. Is Pork A Complete Protein? Best Priced Pork For Protein – Low Fat! Yes just like all red meats and most poultry, pork contains the essential 9 amino acids, research studies claim “Pork tropomyosin had an amino-acid composition very similar to that of the other species says research gate.” The other species they talk of are beef, lamb and rabbits. Great news for Mr Pork, it’s found to be high in quality protein right up there with beef. Just in case you’re wondering what a complete protein is, a complete protein (or whole protein) is a source of protein that contains a sufficient amount of all nine of the essential amino acids necessary for our dietary needs. Pork belly – High in fat, can be super tasty boiled then roasted in the oven with honey yummy! Only 13g of protein and 21g of fat per 100g, it’s a no for a healthy protein source. Eat on a cheat day if you love it. Pork loin chops – Lower in fat at 14.6g and with a whopping 23.6g of protein per 100g loin pork chops really pack a protein punch. Remember you can cut off the fat making this a much leaner choice. Pork should shoulder – There are nearly 300 calories in a 100gs of pork shoulder, with 21g of fat, but impressive 22.4 g of protein, the shoulder is out unless you are looking to gain some weight. Pork crown roast – A little lower in fat than the pork belly and shoulder, it comes in with 14g of fat and a healthy 21g of protein something to consider if you watching the $’s for your next Sunday lunch. Pork cutlets – Similar fat content to the pork chop at 12.25g and slightly more protein 25 g pork cutlets are a considered choice. Pork loin lean (tenderloin) – Watch out pork tenderloin can be pricey! Very low in fat with just 3.6g and not surprisingly the highest in protein with 26g per 100g. After having a good look at our list above we need to find a cut of pork that’s cheap, relatively low in fat and most importantly high in protein to try and rival the chicken breast. On this basis I think we’ll have to eliminate shoulder and pork belly, way too high in fat, we’ll throw out the crown roast, sounds tasty but it has to go, low in protein, and lastly pork loin, it is similar in price to sirloin beef steak so that’s out too. So by a country mile, I’d go for pork chops or pork cutlets both considerably high in protein. In UK Tesco you can buy a kg of pork chops for £5 pack of 8……Pork loin cutlets/ steaks £8 – 1kg. With very similar fat and protein contents, pork chops seem a no-brainer unless you are looking for a more tender cut then I would recommend the cutlets. Price wise compared to Pork, Tesco best-priced chicken breast fillet comes in at £8 per kg priced the same as pork cutlets. If you are looking at spending similar money when trying out pork, best loin cutlets are a great choice, a lovely tender cut of pork and make a nice change from the chicken breast. Tip: marinate overnight in your favourite sauce. Pork chops are the outright winners, they are certainly the main contenders for knocking chicken breast right out of the ring. Trim the fat of the pork chops or ask a butcher to trim, this will considerably lower the fat content. Once that fat has been trimmed from the chop, it makes for a lean, tasty, high protein low-fat alternative to the chicken breast. Source of vitamin b12 and b6 and b3 helps break down carbs and fat, giving your guns access to the energy. Protein with an average of around 23g per 100g, there’s no doubt you get a get a good bang for your buck if you are looking to gain muscle size eating pork. Rich in Zinc, helps produce testosterone, used to build muscle. High in selenium, research suggests selenium helps muscles recover faster after being worked to exhaustion. research also found it could increase strength. Slightly higher in calories at 150 cals per 100g, contains a good amount of niacin, aiding a healthy digestive and nervous system. Averaging around 25g of protein per 100g surprisingly similar amount of protein compared with a pork loin chop. Boasting a relatively high amount of omega 3 fatty acids, organic chicken 40% more, chicken offers almost twice as much of the heart-healthy oil compared to pork. If you are fed up with chicken and looking for a change, then I’d certainly recommend you give pork a try. Avoid the highly processed foods like sausages full of fat salts and nitrates, and pick up a pack of pork chops nearly half the price of chicken breast per kg. It’s a great alternative for weight trainers as the protein content is only a tiny bit short of chicken. 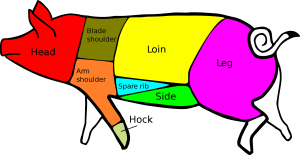 Adding another meat such as pork to your diet gives more variety and variety is key to any diet. Great post, I tend to go away from pork when trying to eat better, but I do like it, thanks for bringing light that having pork isn’t all bad. I always thought chicken was the way to go so I always ate that, might have to through in some pork as well. Would you suggest pork chops and pork cutlets for someone that’s trying to lose some weight? Yeah, if you are trying to lose weight just trim the fat of the pork chop and it will make for a lean cut of meat. Real instructive and wonderful complex body part of content material, now that’s user pleasant (:. I’m impressed, I have to say. Actually hardly ever do I encounter a blog that’s each educative and entertaining, and let me tell you, you have hit the nail on the head. Your thought is excellent; the difficulty is one thing that not enough persons are talking intelligently about. I’m very joyful that I stumbled across this in my search for something regarding this.